Taken from: The Effects of Nuclear Weapons, by Glasstone and Dolan. Nomograph Chart Below, their page 399. But read this first. after the blast where you are. You learn that the dose rate is 1000 Rads per hour. (7 times the 2 days) in 2 weeks it will be down to 1 R per hour. takes 600 hours or 25 days total, to be sheltered. the bomb hits. Then 24 hours later it is down to 1. 5 R per hour. Remember changes in your blood begin with exposure to 50 Rads. a Big Gulp. CLICK HERE to learn about the 7/10 Rule and how it reacts. You must learn that if you want to live. house in Salt Lake City. And Provo City with most of Utah Valley. Why is it that people will not listen to a man sent from God to warn them? Then how many hours since the bomb hit. That is the column on the right. TIME (HR) Above the word fallout. Do you see that? THAT is where the critical number is at for you. I will repeat this instruction again; Below the CHART. you can make copies to mark up. This can help keep you alive. First find what the Rate is per hour where you are at. That is the column on the left. has numbers starting at 10, 000 down to 0.01 Do you see that? THAT is where the critical number is at for you. Lets do an example for you. 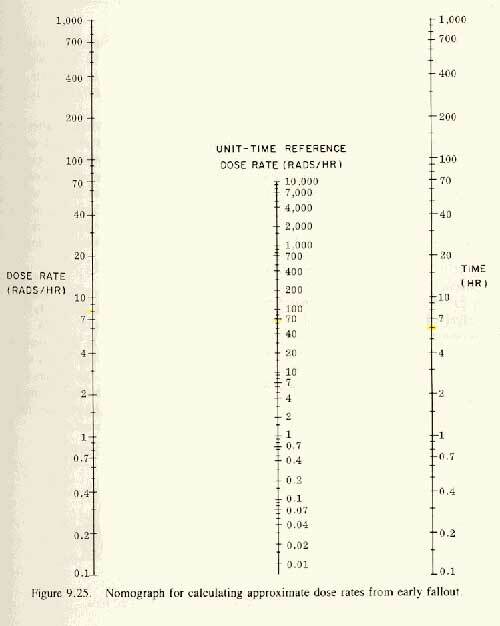 Say you learn the dose Rate is 10 (Rads/HR) per hour. 15 hours in the right column. Your line will extend to the word Time. Now in the left column near the bottom find 0.4 the next mark up means 0. 5 OR 1/2 RAD. Now once you hear of the outside Dose PER HOUR you can compute your shelter stay. Smart you! Others will go outside too soon and in a few weeks they will die! Smart you! It kind of makes it worth clicking on my site, huh! ! Now that you know you need to stay sheltered for 175 hours what else can we learn from this chart? Using the 250 reference point you can calculate what the Dose Rate will be at 40 hours. PER hour in the left column. So at 40 hours you can go out for about 1 hour and 45 minutes. Keep your dose below 5 Rads! Per day if you want to live. Caution! Don't use Nomograph information as absolute. "Any bomb" may alter your estimates. more. Rain OR Snow can quickly alter the dose rate as it pulls down the fallout below 30, 000 feet. Big hits of Megatons go up to 100, 000 feet (19 miles high) and are above storm weather clouds. High altitude winds blow East at 70 to 100 + miles PER hour. So California fallout will reach Utah in 4 + hours. By then some of it has fallen from 100,000 feet down to the ground. And it's only 4 hours old. What if the fallout keeps coming down for 5 or 6 hours? Say, - 2 days after you hear of Targets WEST of you are hit. No more Big Mac's or Whoppers for awhile. Now think a second, what would it mean if dose rates are dropping and then go up again? It means new fallout from another hit has arrived. IF you have an emergency and you must go outside, get no more than 5 R ! in any 24 hours. That means if the rate is 10 R PER Hour you have 1/2 hour outside OK. You can still live! But don't get any more! because you will get 5 Rads total. When you come back in don't bring in fallout on you. Strip and wash clean. For example: Everyone knows of Las Vegas Nevada. Nellis Air Force Base is only a few miles from downtown Las Vegas. When Nellis AFB there is hit. The winds usually blow E. by NE. at 10 to 20 MPH. And the fallout will blow east 100 miles to Saint George Utah and will kill every single person not sheltered. Nellis Area II has about 1500 of the USA Nuclear Warheads stockpiled there. One of the 1st. targets to be hit is our stockpiles. They want our weapons destroyed. So do you think the people in Saint George Utah have a chance to live? See where the rest are. CLICK HERE They are listed on this link. IF a low pressure area is over all of Southern Utah and it is snowing, or raining all of Southern Utah can be deadly. Winds blow into "LOW" Pressure areas. Watch the weather forecast daily to see what is coming. Notice the story from the New England Journal of Medicine on April 30, 1998 They project everyone dies for 180 miles downwind, and St. George is only 100 miles East from the Target. It may become a desolate City for years to come. Their leaders tell them everything is great! All OK ! People who are exposed to fallout for any time can have problems. When they only have 50% Lymphocytes AND Platelets, they can expect death soon, (in days) so don�t waste medicine on them. CLICK HERE and print out that information to save.